Thyroid carcinoma is one of the most common malignancies encountered, showing a progressive trend with an incidence rate of 3.9% in females to 1.3% in males. Unless the distant metastases are present, it can be treated with an excellent prognosis. Most thyroid cancer patients are in either euthyroid or hypothyroid state. However, thyrotoxicosis can also be seen in association with thyroid cancer. Follicular carcinoma thyroid is the most common variant associated with functioning thyroid cancer leading to thyrotoxicosis. Thyrotoxicosis in these patients can be morbid, due to the presence of symptoms such as palpitations, anxiety, tremors, and hyperdefecation. Hence, alleviation of symptoms of thyrotoxicosis is very important along with a reduction in tumor burden to improve the quality of life. A 63-year-old woman initially presented with a neck swelling, of 25 years duration, which was progressively increasing in size for 3 years. There was no history of dyspnea, dysphagia, or hoarseness of voice. On ultrasonography, there was a large hypoechoic nodule of size 13 cm × 6.2 cm × 11.6 cm replacing the right lobe of the thyroid, with areas of heterogeneous cystic and calcific foci. Fine-Needle Aspiration Cytology revealed follicular variant of papillary carcinoma thyroid, following which, the patient underwent total thyroidectomy. Post total thyroidectomy histopathological examination (HPE) was suggestive of follicular variant of papillary carcinoma thyroid (pT2NxMx). 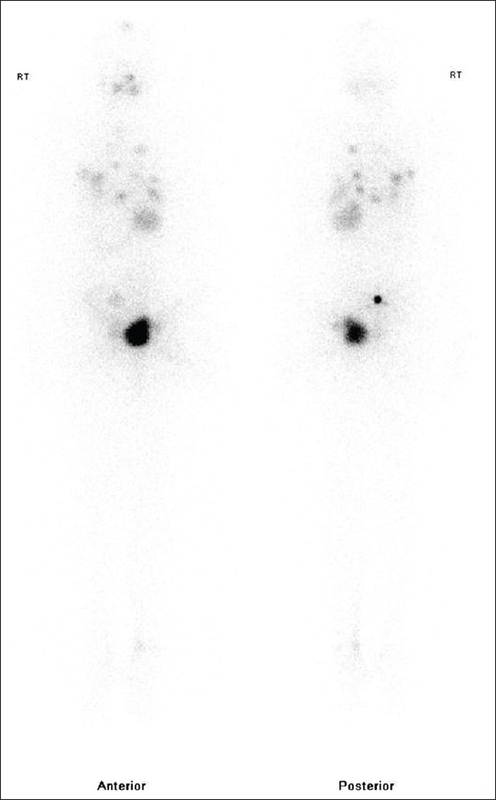 Post-thyroidectomy, diagnostic radioiodine I-131 whole body scan (WBS) revealed multiple radioiodine avid lung and bone metastases with no evidence of iodine-avid residual thyroid tissue in the neck [Figure 1]. The patient was advised high dose radioactive iodine (HDRAI) therapy but defaulted for treatment. After 2 years, the patient presented with a headache, soft-tissue swelling in the right frontal bone and thyrotoxic features of weight loss, palpitations, and anxiety. Surgical excision of the frontal swelling was performed. Postoperative HPE was suggestive of papillary carcinoma thyroid deposits. Clinical examination revealed a high pulse rate of 112/min, irregular rhythm, normal volume pulse with no radio radial delay or radio femoral delay. The patient also had tremors, increased perspiration and a staring look with prominent eyes. Biochemical parameters were total T3-380 ng/dl, total T4-14.8 μg/dl, thyroid-stimulating hormone (TSH)-0.03 mIU/L, Tg > 481 ng/ml and antiTg was 1.0 IU/L. In view of high Tg levels, I-131 WBS was done which revealed, multiple radioiodine avid cervical lymph nodes, lung, and skeletal metastases [Figure 2]. 200 mci of HDRAI therapy was administered orally. Vitals were monitored regularly. 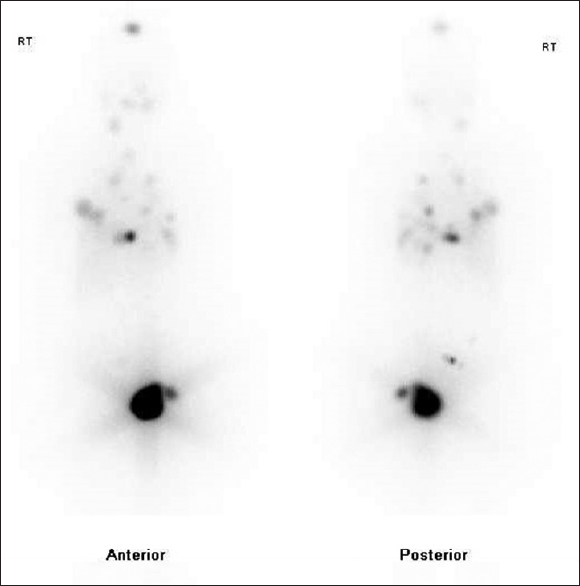 PostHDRAI therapy scan revealed good localization of radioiodine in thyroid bed, lymph nodal, lung, and skeletal metastases [Figure 3]. In view of high spinal instability score at D9, D10 vertebral lesions, she was advised for radiotherapy and zoledronate. Hormonal suppression treatment with thyroxine 200 mcg was given. On follow-up after 6 months, her thyrotoxic features subsided with serum TSH-0.03 mIU/L, T3-0.5 ng/ml, and T4-12.3 μg/dl. Follicular carcinoma thyroid is more commonly associated with functional metastases than mixed papillary-follicular or pure follicular carcinoma. In these patients, all the clinical manifestations of thyrotoxicosis are seen except for dysthyroid eye disease., Measurement of free T3 (FT3) and free T4 (FT4) is important, because these patients may develop isolated T3 or T4 toxicity. Hence when a patient is presenting with thyrotoxicosis, the possibility of malignancy should not be neglected. A study by Salvatori et al. showed that long-acting thyroid stimulators (LATS) promotes the growth of metastatic thyroid cancer cells by stimulating TSH receptors. All the above criteria were met in the current case. The treatment in such patients is challenging as treatment should be aimed at thyrotoxicosis and thyroid cancer simultaneously. As the thyroid cancer metastases in our case are radioiodine avid, the cornerstone of therapy is HDRAI ablation. However, transient accentuation of thyrotoxicosis may occur following RAI therapy. Hence, pretreatment with antithyroid medication is recommended for severely toxic patients with the poor clinical condition. Sole treatment with high dose antithyroid drugs in frequent intervals is inefficient in improving the clinical as well as the curative outcome. It has also been documented that, in patients with thyrotoxicosis due to increased basal metabolic rate, the iodine metabolism is increased, thereby rendering the RAI therapy inefficient and requiring more doses when compared with normal thyroid cancer patients. Post-HDRAI therapy, the patient was kept on hormone suppressive therapy with thyroxine, to reduce the TSH levels which can proliferate the tumor leading to recurrence. Hormone suppressive therapy should be done with caution in these patients, as it could lead to thyrotoxic storm. To reduce the tumor proliferation and to control thyrotoxicosis simultaneously is an uphill task. Neoplastic hyperthyroidism is not a rare entity. Hence, a watchful insight should be present whenever there is a high Tg level or there is an increase in TSH during suppressive therapy. High dose RAI remains the mainstay of treatment to reduce the tumor burden and thereby thyroxine secretion. The prognosis in such patients principally depends on the extent of metastatic disease. Sekkath Veedu J, Wang K, Lei F, Quan C, Huang B, Mathew A. Trends in thyroid cancer incidence in India. J Clin Oncol 2018;36:e18095. National Cancer Institute. Cancer Stat Facts: Thyroid Cancer. Available from: https://www.seer.cancer.gov/statfacts/html/thyro.html. [Last visited on 2019 Jan 10]. Haraj NE, Ahandar H, El Aziz S, Chadli A. Association of hyperthyroidism with differentiated thyroid cancer. Pan Afr Med J 2016;24:18. Higgins HP, Hershman JM. The hyperthyroidism due to trophoblastic hormone. Clin Endocrinol Metab 1978;7:167-75. Edmonds CJ, Tellez M. Hyperthyroidism and thyroid cancer. Clin Endocrinol (Oxf) 1988;28:253-9. Salvatori M, Saletnich I, Rufini V, Dottorini ME, Corsello SM, Troncone L, et al. Severe thyrotoxicosis due to functioning pulmonary metastases of well-differentiated thyroid cancer. 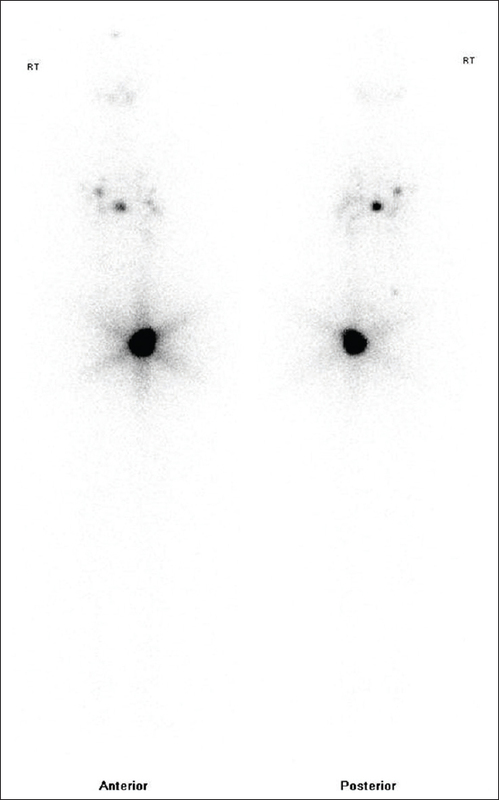 J Nucl Med 1998;39:1202-7. Gozu H, Avsar M, Bircan R, Sahin S, Ahiskanali R, Gulluoglu B, et al. Does a Leu 512 arg thyrotropin receptor mutation cause an autonomously functioning papillary carcinoma? Thyroid 2004;14:975-80. Damle NA, Bal C, Kumar P, Soundararajan R, Subbarao K. Incidental detection of hyperfunctioning thyroid cancer metastases in patients presenting with thyrotoxicosis. Indian J Endocrinol Metab 2012;16:631-6. Beierwaltes WH. The treatment of hyperthyroidism with iodine-131. Sem Nucl Med 1978;8:95-103. Bonnema SJ, Hegedüs L. Radioiodine therapy in benign thyroid diseases: Effects, side effects, and factors affecting therapeutic outcome. Endocr Rev 2012;33:920-80.